Having a properly mapped logistics network is key to any strategic decisions in supply chain management. We do complex studies and modeling of logistics networks for clients who are making decisions about the future of their logistics network. Be it because of the need to optimize costs in the current business model or because of planned changes to the logistics network. Possible savings and optimization of processes in the current model can always be found. And at the same time we can also figure out which of the possible future scenarios is most efficient for the client. The logistics network usually grows organically in response to business development. When the market situation changes or a new business plan emerges, clients face the question of how to build their network for the future. Naturally they want it to be cost-effective and competitive in terms of customer service. It does not matter whether the client is a multinational company for which network optimization means annual savings of tens of millions of dollars or a smaller local company. Any company with a distribution network needs efficient logistics. From where to where is the goods being shipped, where is it stored, how much does the supply chain cost and what other factors affect it. This is the first thing we need to look at when modeling a logistics network. From current data and information about average costs, we compile and visualize the current logistics model. Possible future scenarios will be compared to this model later in the process. We often find that when the client sees the current situation in front of him on the map, he realizes some aspects and challenges of his current supply chain. What changes should be reflected in the logistics network? Does the client need to add another distribution center because the current ones have limited capacity? Or on the contrary, reduce the number of distribution centers because the network is too complex? Is there a need to look for synergies between distribution to points of sale and direct distribution to online customers? Here the client’s plan for the future comes to play. According to it, we jointly choose the factors to be taken into account in future models. Based on the input and consultation with the client, we can identify the possible future scenarios for the logistics network. Subsequently, in each of them, we locate key points, primarily distribution centers. Typically, part of the scenarios apply the “build on green field” approach. The other part uses some of the existing logistics network points. To localise distribution centers we use a specialized logistics software. As soon as we know the location of all the key points of the logistics network in each of the possible scenarios, we can start modeling. For each scenario, we calculate the cost of all phases of logistics, the cost of warehousing, possible costs of building new warehouses / distribution centers or leaving the old ones, and take into account any other factors that may come into play. The output of this step is a comparison of all scenarios with the current situation and with each other. Strategic changes in the logistics network affect the supply chain in long-term. Various variables come into play here, whether in the area of ​​growth of own business in different segments, or in general market indicators such as inflation, labor cost, fuel prices etc. As part of a complex logistics network study, we also provide clients with tailor-made interactive comparison tool. Our Comparison Tool allows the user to set the indicators according to his current needs and visualize the development of possible scenarios in the coming years. Thus, the client can compare, for example, how his individual scenarios will behave with decrease in sales and higher inflation or with a gradual increase of the price of labor and fuel. Network modeling is a complex area. 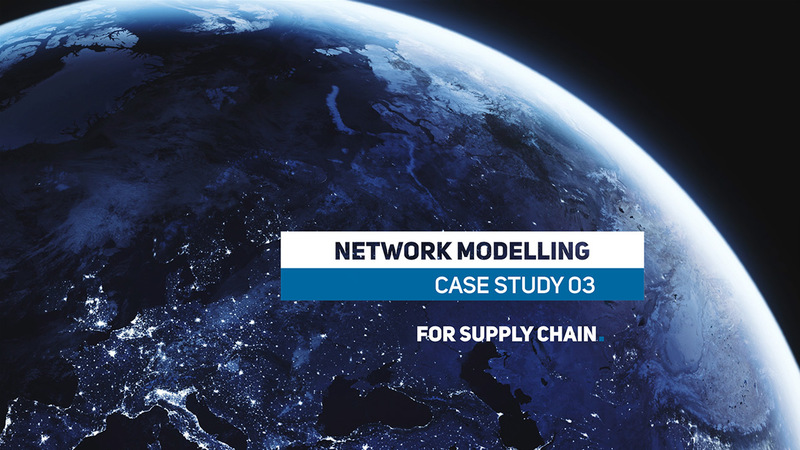 Besides large complex studies, such as the New Model of Distribution Network, we have performed many other studies related to logistics networks. 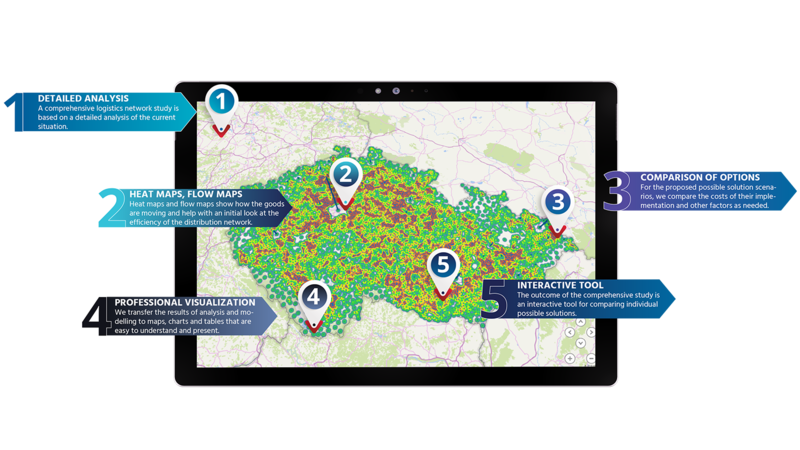 We can name for example Localisation of a New DC or Optimization of Regional Distribution.